Blindness and age didn't stop this woman from finishing the NYC Marathon. This is a guest post by Mike Lieberman. He came to support me at the marathon, and took some great pictures. (It’s also his voice you hear cheering me on in my marathon video.) 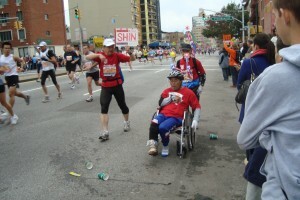 In watching the marathon, he was inspired by some of the participants and asked to write a post. I went to check out Al on Sunday and support him in running his first marathon. Besides supporting him, I found a great source of inspiration while I was waiting for him to run by – the “handicapped runners.” This group included a 75 year old blind woman, a dude with cerebral palsy on a modified bike, an older couple using one of those bikes that you peddle with your hands and some dude with no legs using a similar bike. I stood there in complete and total amazement. I felt like starting to run myself. The feeling that overcame me was a bit overwhelming. The only thing that made them handicapped was the label that we placed on them. It got me thinking about family and friends who come up with excuses as to why they can’t exercise. I don’t expect everyone to run a marathon, but at least doing some form of physical activity to know that you are alive. Take the stairs, walk for 20 minutes, step away from the TV and do something! I have a relative who is on Weight Watchers and drives the three blocks to the meetings. Am I the only one that finds that to be ironic? Or another who complains about all of their “ailments” and does 0 physical activity. These ailments are just excuses for living a dormant life. It saddens me to see people that are close to me come up with excuses as to why they can’t take care of themselves, then complain about their ailments. These runners gave me a whole new appreciation for life, inspiration for working out and taking care of myself. It showed me that with the right attitude, anything is possible. We are all going through our own thing in life. I get that. It comes down to how you deal with what happens. Are you going to feel bad about yourself and do nothing? Or are you going to take that negative and use it as a source of inspiration? I’m not sure about you, but I’m certainly not letting a 75 year old blind woman show me up. Mike Lieberman resides in New York City and provides simple solutions for living in a complex world. Besides his own blogs, he contributes to others across the web. You can find all of his work at CanarsieBK.com and follow him on Twitter @CanarsieBK. Right on, Lenny. 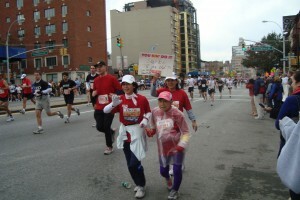 Anyone can do a marathon if they really want it! I too found inspiration in watching the same people you mention. It was amazing to see how they have overcome their disabilities to accomplish something so difficult. I've seen people with various disabilities involved in various physical activities, and it really shows that it's our minds and our excuses that hold us back, not our bodies. You got that right, Kartik. Good thing you don't make a lot of excuses–that's why we had a great workout today!